This is the fourth in our series of making the most of your MxToolbox account. Today, we’ll discuss DNS tools that make it easy to see your DNS configuration. DNS is the backbone of the internet. If your DNS is not setup properly, no one will find you online, send you email or be able to access your online store. Checking DNS is incredibly important, so MxToolbox has created a number of lookups dedicated to checking your DNS configuration. All of these are accessible from our SuperTool interface. 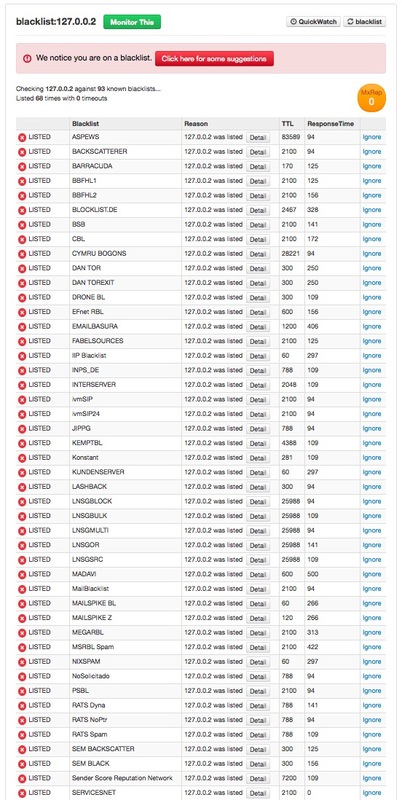 DNS (Name servers) – Check your DNS name servers for configuration issues. DNS Propagation – Check DNS records across your name servers to verify they are propagating when updated. DNS Propagation has its own page. A, MX, CNAME, TXT, etc – Check individual record types to ensure they are setup and responding correctly. If you want to know more about DNS, there are many resources on our blog. 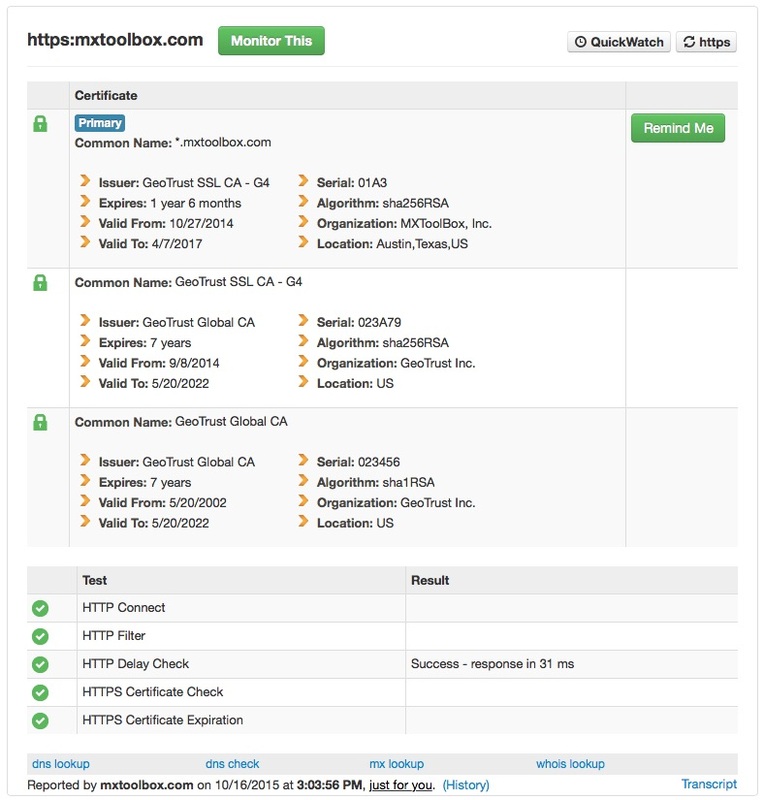 Our next installment in this series will go over Website lookups for HTTP/HTTPS. This entry was posted in How to Make the Most of MxToolbox and tagged DNS on October 22, 2015 by MxToolbox Blog. This is the third in our series on making the most of your MxToolbox account. Today we’ll talk a little about email troubleshooting and what results you can receive from MxToolbox email lookups. To receive email, you need to have MX records setup for a domain. 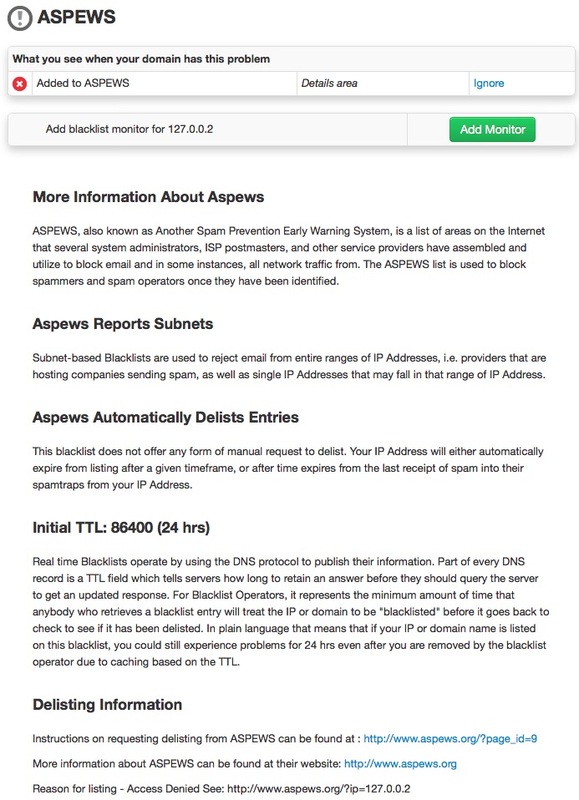 These can be setup to point to your ISP’s email services, a third-party email service like Gmail or Outlook.com or even an email server sitting in a backroom at your office. Regardless, you need to make sure your MX records are properly setup or no email will find it’s way to you. You can test you MX records with the MxToolbox SuperTool. Open Relay – Whether or not your server is an open relay. It should not be. 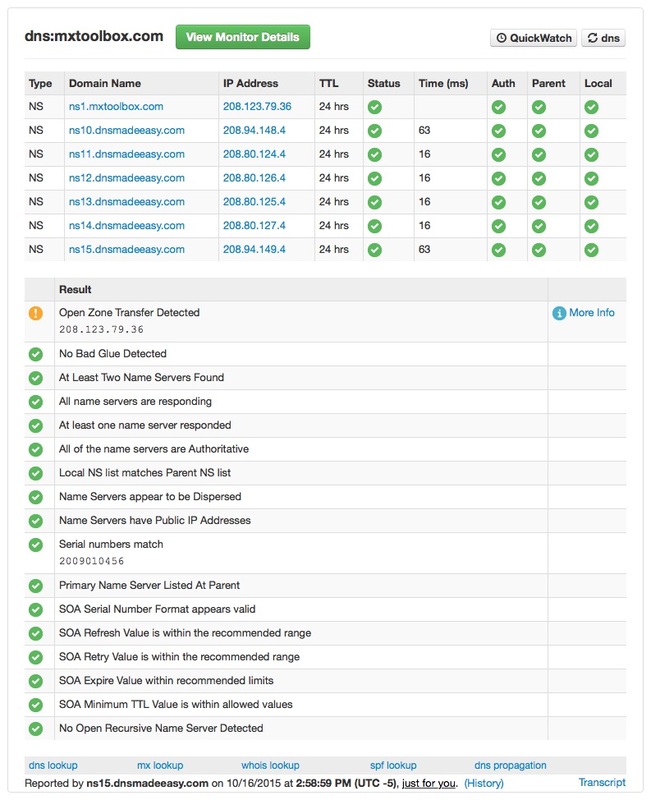 Reverse DNS Mismatch – DNS matches the IP address and there is PTR record pointing back from the IP address to the domain. Valid Hostname – Checks that reverse DNS is a valid hostname for the DNS. 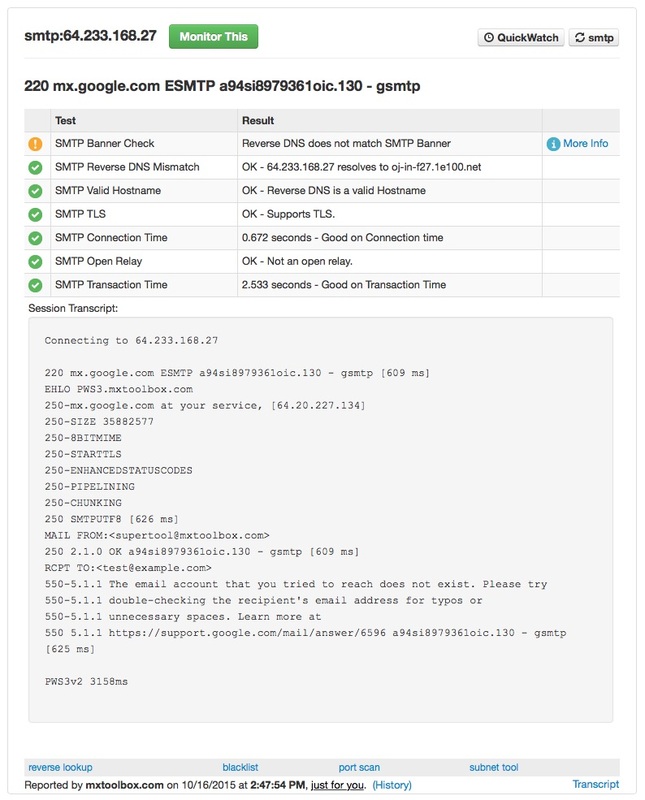 Banner Check – Checks that reverse DNS matches the SMTP Banner. TLS – Checks that the server supports TLS encryption. Connection Time – Checks connection time. Transaction Time – Checks total transaction time. Once your email server is up and running and accepting email, the next question is will your email be accepted by your customers, partners and vendors. Email delivery can be a challenge for companies, especially small companies getting started. MxToolbox has several lookups that can give you insight into whether your email is deliverable or if your deliverability configuration is working beyond the basics of “Am I on a blacklist?”. SPF – Check your SPF configuration, which specifies which servers are able to send from your domain. DKIM – Verify that you DomainKeys Identified Mail setup is correct and accessible. DMARC – Check your DMARC configuration to ensure that others can read it and send you rejected email from your servers and validate email coming from you. Email Deliverability – See if your domain is on an email delivery problem list. Sometimes email seems to work properly and yet a message takes days to arrive. Sometimes you need to analyze a message to makes sure your system is processing everything correctly or investigate a suspicious email. MxToolbox created a handy email header analyzer just for that purpose. Header Analyzer takes your email headers and runs a complete analysis of hops, delays, and important email delivery information. Use it to decode email delays! In next topic of this series, we will discuss using DNS lookups. This entry was posted in How to Make the Most of MxToolbox and tagged email on October 19, 2015 by MxToolbox Blog. How can I make full use of my MxToolbox account? MxToolbox has a suite of 30+ tools that makes it easier for IT Professionals and others to do their daily jobs, like setting up and validating email servers, DNS and network configurations or developing and maintaining websites. With this many tools to choose from, it can be daunting for a new user to get the most out of the site. This series of posts will give you an idea of the features of MxToolbox and how best to use MxToolbox to go about your daily tasks, including detailed use cases from our experts. We will add links below as we expand this series. First off, most of our tools are free to use. You can use them as much as you’d like and they will still be free. That’s our culture. There are a handful of paid tools, mostly for power users in our Professional interface (more about those later). You can use our free tools whether you decide to register or remain anonymous. However, registration gives you access to a free monitor, which you might find useful, so we always recommend registering. Our tools are concentrated in the following categories to make executing your daily tasks easier. All of our tools can be accessed from the More Tools page and while our most used tools (described below) can be accessed using the Supertool via a drop-down or command-line style interface. Select from drop down the query you would like to run or, optionally, type your query. For example, you can type “mx:mxtoolbox.com” to run an MX lookup on our domain. Use the IP address or domain that you are researching. Note: Some queries require either an IP address or domain while a few accept both arguments. Those with different arguments may have differing results depending on the argument. Other queries may require a selector. Check out the help on the lookup page for more information. Check back to this page as we add new entries around tools and use cases. This entry was posted in How to Make the Most of MxToolbox and tagged Free Tools on October 13, 2015 by MxToolbox Blog.